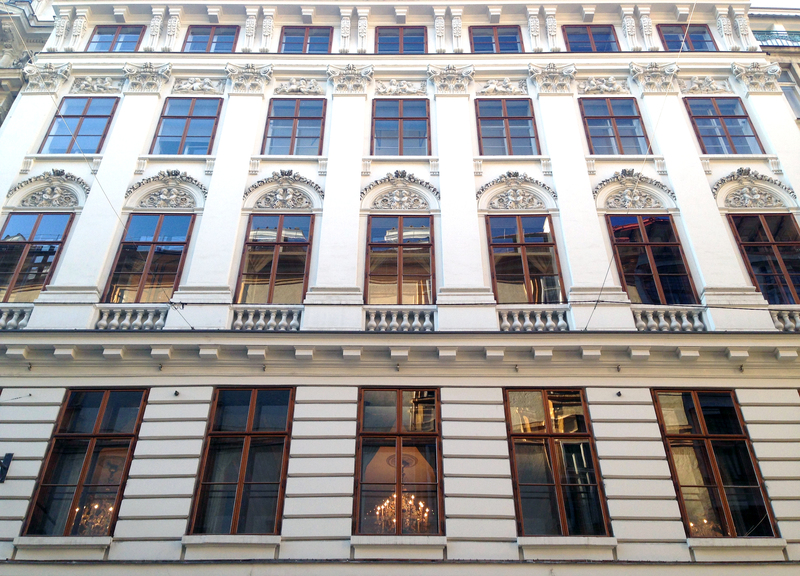 Vienna is a city that radiates elegance – around every corner, cream-coloured buildings with rows of super-shiny windows, the ground level a procession of bakeries and jewellery stores and amazing-smelling coffee houses complete with uniformed waiters. It also has the grandeur one would expect of a former imperial capital, with institutional and cultural residences on a breath-takingly garganutan scale – from the lattice-like spires of the Town Hall to the majestic white columns of Parliament. Perhaps the crown jewel in the city’s spectacular architecture is St Stephen’s Cathedral – a 12th-century Gothic edifice that looks like it’s made of bleached bone, with an interior that’s like finding yourself in the fossilized ribcage of some impossibly gigantic mythological animal. Although crawling with tourists, the sombre beauty of the cathedral still casts a powerful spell, with its brilliantly beaming stained-glass windows, the soft orange glow of candles lit for the dead, and the smell of incense and stone – all inspiring one to hush, put down the phone for a moment and just soak up this otherworldy place with the reverence it deserves. After we stepped back into the bright, noisy, 21st-century world outside, I realised I had to go to the toilet. I knew the Stefanplatz U-bahn station would have one so I ducked down the escalators, followed the ‘WC’ signs and having found what I was looking for, marched in. I stepped into a cubicle and was about to let it flow when suddenly an old woman bursts in, yelling in German and, to my bewilderment, attempting to force herself into my cubicle even as I’m trying to keep the door shut with one foot while I frantically tuck myself back in. For a moment I was horrified, thinking I must’ve stepped into the ladies by accident to elicit such a violent reaction – but no, I’d simply not paid the 50 Euro cents fee… So there I was, barely zipped up, my bladder in despair, in the middle of a men’s lavatory trying to explain to an angry old Germanic woman that I only had Hungarian forints and Aussie dollars. She shooed me away and so off I went, having experienced what is perhaps the less endearing side of Vienna – that ornung mentality; rules before people. Fascinatingly, it turns out this guide used to be an interpreter for Czechoslovakia’s Communist regime, and he makes his contempt for their intellectual as well as moral bankruptcy abundantly clear. He just related how he often had to ‘transmodify’ (rather than merely translate) what these “primitive creatures from the Party” told western journalists, as the latter would not otherwise believe the stupidity/crudeness of what was coming out of their mouths… In much the same way we find it difficult to take North Korea’s rhetoric seriously today, even as we recognise they’re legitimately dangerous in their delusions of grandeur and lack of regard for humanity. In Slovakia back then, as in its many neighbouring states, Communism was no joke, with thousands of people imprisoned, tortured and killed by secret-police thugs. As with most eastern Europeans, it’s apparent that political correctness isn’t high on the agenda for Miroslav. Commentary has already deviated several times to Putin’s ‘imperialist war’ in Ukraine; the “resistance to domestication” of Bratislava’s Gypsies, who consistently destroy the public housing provided to them; and Angela Merkel’s controversial promise to accept 800,000 immigrants from the Middle East, some of which have ended up in Slovakia – “a serious problem,” he explained, “as we are a Christian country and these people demand a different way of life.” In Australia we’ve become disturbingly accustomed to a liberal fascism that shuts down any discussion about cultural issues as ‘racist’, so it was refreshing to hear a man who knows history all too well express his thoughts about the latest threat to show up at his borders. Anyway – back to Bratislava. Like many former Soviet bloc cities, the outer ring of the city forms a dismal first impression, built as it was during Communism and comprised primarily of featureless grey monoliths with graffiti on the walls and weeds sprouting out of the cracked concrete. Penetrate this though and you discover the opulent old heart of the city, which the famous writer of fairy tales, Hans Christian Andersen, once described as a fairy tale in itself. Bratislava is the archetypal gateway between the east and west of Europe, with inhabitants that generally speak three languages – English, German and of course Slovak, which, as the guide pointed out, is virtually interchangeable with Czech and very similar to Polish, as I realised when I could suddenly understand most of the billboards flying past the bus windows. Actually I’ve been surprised at how similar Slovakia is to Poland in all sorts of ways – linguistically, gastronomically, even religiously, Slovak Catholicism tending to focus on the Virgin Mary (rather than the big man Jesus) in much the same way the Polish church does. Of course, as a western-Catholic-Slavic nation, this makes sense – and was driven home at lunch when I ordered the ‘beef brisket’ plus whatever Slovakian beer was on tap at a local tavern. 10 minutes later the buxom blonde waitress delivered a chunky chalice of lager remarkably similar to Okocim (my favourite brew in the world) and an amazing dish swimming in rich onion sauce and accompanied by purple cabbage, roast potatoes and a big dollop of sour cream. I vacuumed it up like a starving Labrador and realised how much I love and miss the hearty food of this region – and how deprived we are of it in Melbourne, for all its culinary cosmopolitanism, unless you happen to be blessed with a babcia. It’s incredible how much history, both wonderful and tragic, is crammed into this part of Europe – this amazing intersection of Slavic, Germanic and Magyar cultures; of Catholicism and Protestantism and Orthodoxy; this dynamic stew-pot of cabbage, pork, paprika and peppercorns. The bus trip from Vienna to Bratislava is just 60 kilometres – less than Melbourne to Geelong – and there’s not even a checkpoint in-between; one of the benefits of the Schengen Area which also incorporates Poland, Germany and Hungary. History permeates everything here – the very highway we’re driving on used to be a Roman road 2000 years ago, the peaceful fields on either side once the bloody battlefields between Roman legionnaires and the barbarian tribes of the north. Classical music is of course one of the great exports of this region, every major city having a famous genius to call its own. In Budapest it was all about Fransz List; in Vienna, of course, Mozart is front and centre. No doubt I’ll learn all about Beethoven as we make our way through Germany and in Poland, of course, the star of the show is Chopin. What’s interesting is that these men were far from humourless poonces in big wigs – they were very much the Keith Richards of their day. While we assume that women fainting and screaming in front of pop stars is something that started with Elvis and the Beatles, it predates them by at least 200 years… Liszt, famously, would pull off his white gloves and hurl them into the crowd before bashing out one of his tunes, knowing that women would literally rip them (and each other) apart in the frenzy of trying to get one. Mozart, for his part, died quite poor despite his enormous commissions because of all the money he poured into throwing wild, lavish parties. Anyway. It’s wonderful being back in Vienna, the first city I ever fell in love with and the city where I met the first girl I fell in love with. As before, I still cherish its blend of Old World glamour and new world modernism: the clattering trams above and slick subways below; huge advertisements for luxury cars and perfume draped over gorgeous Secessionist facades; the surrounding green hills of Austria alive with the graceful motion of wind turbines rising out of the morning fog. There’s no doubt life is lived on a deeper frequency here and temporary though it may be, it is awesome to be able to tune in again and feel the passion and pain of centuries in one’s own soul.